At GoodOnYa bars every ingredient matters and most of all you – the consumer – matter. Nutrition numbers are less important. What is important, are hand picked organic ingredients, real food, food from nature. Even the packaging is bio-degradable. GoodOnYa bars have a few bars in their line. 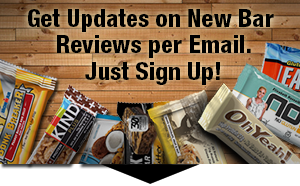 At Gluten Free Protein Bar Reviews we’re taking a look at just the higher protein flavors. INGREDIENTS: Organic Valencia Peanut Butter, Organic Raw Honey, Organic Sprouted Flax, Organic Raw Sesame Seeds, Organic Raw Hemp Seeds, 70% Organic Dark Chocolate: (organic cocoa liquor, organic cane sugar, organic cocoa butter, organic cocoa powder), Celtic Sea Salt, Organic Vanilla. Nutrition facts based on Peanut Butter Chocolate flavor. Facts and ingredients vary by flavor. While all reviewers like both flavors a lot, the Peanut Butter Honey stood out as the clear winner regarding taste. Both bars are satisfying and kept consumers full for a while. Buyers all liked the texture and referred to it as great and moist. 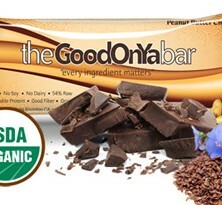 Buyers are so happy with the ingredients, that they even offer GoodOnYa bars to their children. Ingredients are 48-76% raw depending on the flavor and it comes with absolutely no fillers. 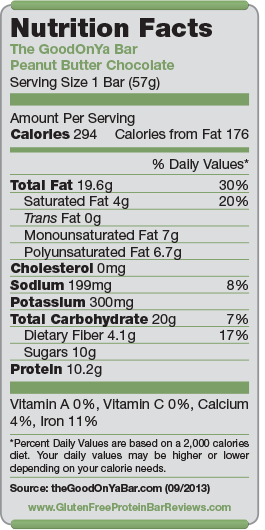 Fat is pretty high, but if you look at the list of ingredients you’ll see that these are all good fats. With $2.75 per bar at retail GoodOnYa bars cost more than the average bar with 10 grams of protein. However, if you ever compared organic to non-organic ingredients, you know there’s a big price difference. Quality ingredients like organic raw nuts and seeds just cost more.